While doing genealogy research in the mid seventies I came across an article titled “It’s Dogwood Time in Tyler County”. In the article it mentioned Valentine and James Burch being in the Battle of San Jacinto and that they were buried in the Burch-Cauble cemetery near Peach Tree Village. Since Peach Tree Village is where Peter Cauble and his family lived I assumed this was where they were buried. 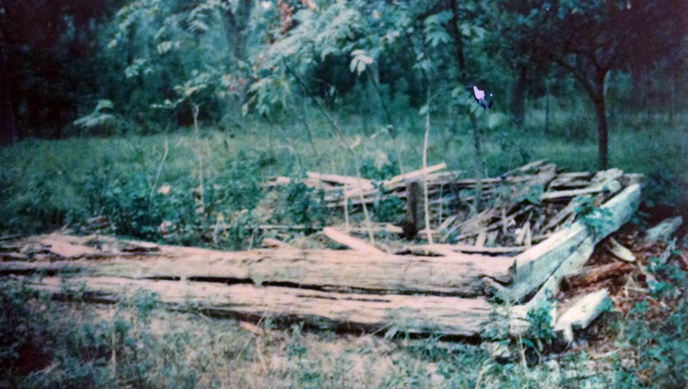 In August of 1977 I went to Peach Tree Village to find the cemetery. I had no problem finding Peach Tree but there was no sign of a cemetery. I went past Peach Tree Village a few miles and before turning around, I noticed a house near the road and an elderly gentleman in bib coveralls on the front porch. I stopped and asked him about the cemetery and he not only knew where it was, he also said the old Cauble house was nearby. Finding the cemetery was my objective but finding the house that my great, great, great grand parents lived in was certainly unexpected. He volunteered to show me where they were and we headed back to Peach Tree Village. There were no signs or markings from the road, only a barbed wire gate and road overgrown in weeds leading to the house. 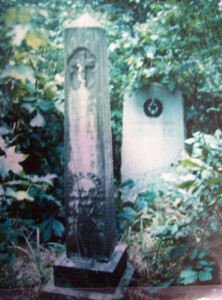 Below are pictures of the house, remains of the smoke house and some headstones. The house was supposedly used by hunters but I can’t imagine anyone staying in it. The gentleman said it was a hewed log house and looking on the back where siding was missing and under the house I could see the original hewed logs. Obviously the clap board siding had preserved the structure. The smoke house was also hewed logs but not being protected by siding, time and the elements had nearly destroyed it. The cemetery was so overgrown it was barely visible. Years later Brian Shivers told me his dad had owned the land for many years (his dad was Allen Shivers, Governor of Texas from 1949- 1957) and while hunting deer in the 60’s he came across the cemetery. He noticed stones lying on the ground and found some markers and realized it was a cemetery. His wife loved restoring historical sites and quickly cleaned the site up, righted the markers and put a chain link fence around the cemetery and reported it to the historical society. That was probably the last time any maintenance was done by the way it looked when I first saw it. Some time later I met Julia Cauble Smith and told her about the house and cemetery. Through her efforts and many family members writing letters to Temple Inland, owners of the property, Temple agreed to give the property to the Tyler County Heritage Society. Through a grant from Temple and several others the house and cemetery has been restored and preserved for the historical benefit and pleasure of many.